Pharmacies nationwide have agreed to provide discounts on their medications to people who use this free prescription drug card. Generic Prescriptions available at discounts up to 50% off retail prices. Brand prescriptions available at discounts up to 15% off retail prices. The following value-added benefits have been added to the Drug Card America program in 2012 and we are excited for you to take advantage of them. Look up the price of your prescriptions before you get them filled. 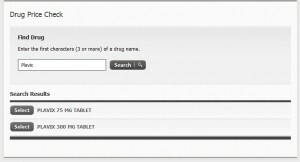 Compare the price at multiple pharmacies near you with this simple-to-use tool. Taking a Brand prescription and paying a ton? You can now compare the cost of the Brand and it’s comparable Generic! The Medical Bill Saver program can lower your out-of-pocket costs on your medical bills not covered by your insurance. They will work with your providers to lower the balance on any uncovered medical or dental bill over $400. Through this negotiation process, you can see between 25%-50% savings on your medical bills. You only pay when they save you on your bills – you pay 25% of your savings for this service. To see if Medical Bill Saver can help you, call 866-799-2690. Through a special partnership we were able to secure discounts on mail-order medical supplies. Order your diabetic supplies, CPAP accessories, catheters, back braces, and more online and save!